Battered by the backlash from Michael Wolff's book, Steve Bannon is trying to make amends with the Trump family, providing a statement to Axios that expresses "regret" to President Trump and praises his son, Donald Trump Jr.
"President Trump was the only candidate that could have taken on and defeated the Clinton apparatus. I am the only person to date to conduct a global effort to preach the message of Trump and Trumpism; and remain ready to stand in the breach for this president's efforts to make America great again." The backstory ... In Wolff's book, Bannon is quoted as saying of Mueller's prosecutors: "They’re going to crack Don Junior like an egg on national TV.'" Be smart: While Bannon's statement may seem like a baby step, he's as stubborn as Trump when it comes to apologizing and admitting he has made a mistake. He views any concession as a sign of humiliating weakness. What's next: Look for Don Jr. to accept the statement graciously. 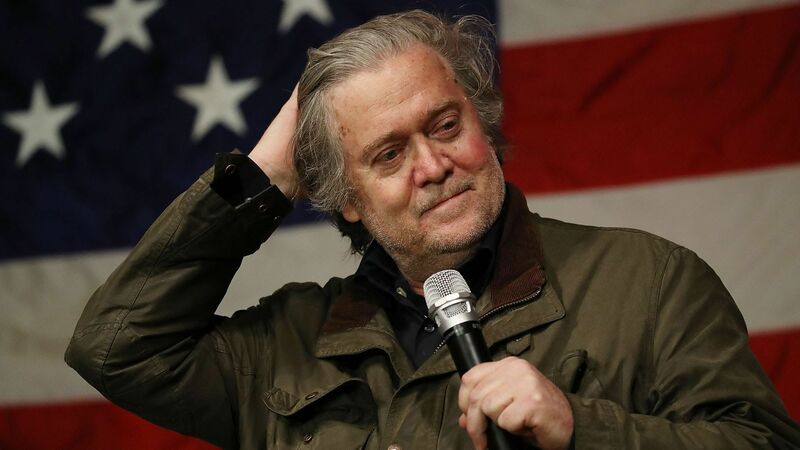 But Bannon has further to go with President Trump: Axios has learned that POTUS has said that he wants surrogates who appear for him on TV to "bury Steve." Axios' Jonathan Swan reported last night: Trump has been working the phones over the past several days, telling allies they need to choose between him and Bannon. P.S. "Fake book" ... Trump tweets as he leaves Camp David: "I’ve had to put up with the Fake News from the first day I announced that I would be running for President. Now I have to put up with a Fake Book, written by a totally discredited author." "Ronald Reagan had the same problem and handled it well. So will I!"